The Corn Maze & Fun Park is now closed for 2018! Following is general admission info and hours for Harvest Moon Acres. Group discounts and special hours are available for groups of 20 or more people. Visit our groups page for more information. Harvest Moon Acres is open in the fall September 22nd through October 28th. Open exclusively to school groups and other large groups of 20 or more on weekdays by appointment only. 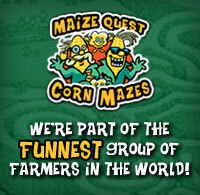 * Extended Hours: The Corn Maze is open for Flashlight Nights Saturdays in October until 10PM. In September, check the Facebook feed on our news page or our Facebook page for extended hours during good weather! Don't miss Flashlight Nights now EVERY SATURDAY in October until 10PM! Come try our maze in the dark for a different twist - but be sure to bring a flashlight in case you "get lost"! Flashlights are also available for purchase. Admission Includes: Access to the Giant Corn Maze, Fun Zone, Fun Barn, Farm Animals, and Hayrides. Harvest Moon Acres is open to groups of 20 or more by appointment. Please visit our Group Rates & Hours page for details.